Home » Eat Well » Did You Know About These Surprising Benefits Of Eggplant? 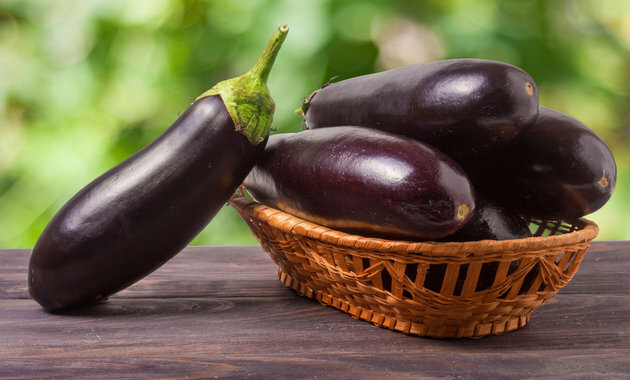 Did You Know About These Surprising Benefits Of Eggplant? Eggplants or baingan are loaded with numerous health benefits. Nasunin is a potent phytonutrient and antioxidant that is found in eggplants. It gives eggplant its color and may help fight aging and cancer. Eggplants are low in carbohydrates and calories so they are a good inclusion for weight watchers as well. Many health experts agree that one cup of eggplants a day will keep many diseases and health problems away. Eggplant contains very little fat or cholesterol and this fibrous and filling vegetable is a huge help in maintaining a healthy digestive system. The fiber enables the body to easily process foods and support the absorption of nutrients by producing gastric fluids within the stomach. Polyphenols in this vegetable such as Nasunin protect cells from damage caused by free radicals, prevent development of tumors and stops the spread of cancer cells. Other compounds such as anthocyanins and chlorogenic acid have powerful antioxidant and anti-inflammatory effects on the body. Chlorogenic acid can also inspire cleansing enzymes inside of cells, which kill cancer cells and can ward off other viral diseases. Iron deficiency can cause debilitating symptoms and you may be able to battle these by including eggplant in your meals. The flesh of the purple vegetable has many essential minerals including iron and copper which assist in improving the health of red blood cells within your blood stream. Eggplant is very good for people who are at a high risk for bone degeneration and osteoporosis. Phenolic compounds have been linked to reduced signs of osteoporosis, stronger bones and increased bone mineral density. Consuming eggplants regularly will also show a significant rise in iron, manganese and calcium all of which are integral if you want to maintain strong bones. Eggplants also contain Vitamin K which improves bone density, overall health and reduces the risk of bone fractures especially in post-menopausal women. As eggplant is low in carbohydrates and high in fiber content, it is said to be good for people with diabetes. Some studies have shown that regularly eating foods that are high in fiber can reduce your risk of diabetes by up to 20%. ← Eating Broccoli May Help To Prevent Prostate Cancer !